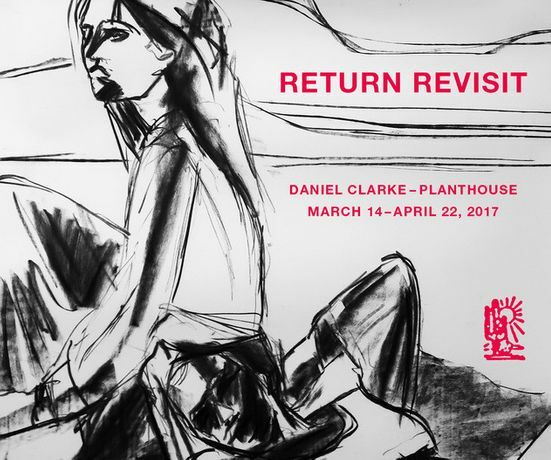 Planthouse is pleased to announce a solo exhibition featuring paintings and works on paper by Daniel Clarke, an Irish-American artist based in Paris. Clarke’s oeuvre has often dealt with memories of his childhood in the US, his current life in France, and the idea that one can be physically in one place but feel spiritually attached to another. Recent works in ink, charcoal, watercolor and gouache, along with oil paintings and lithographs will be on view at Planthouse. They center around contemplative female figures, often seated in interiors and staring into space or turned away from the viewer, their bodies rooted while their thoughts wander. The loose, exuberant lines with which the women are described contrasts with their body language: heads rest in hands, eyes look into the distance with tense disengagement, and seated bodies slouch, defeated. Clarke made these works during a time of political unrest that in his words, revealed the “dark side of our shared culture.” Often torn between two worlds, Clarke grapples with an unfortunate commonality within the two parts of his identity. In his drawings, prints and paintings of individual figures one sees the crisis and confusion of many. Yet Clarke’s invigorated collages and fast, sketchy lines demonstrate how this same turmoil and confusion have inspired artists to create evocative and incisive new works.